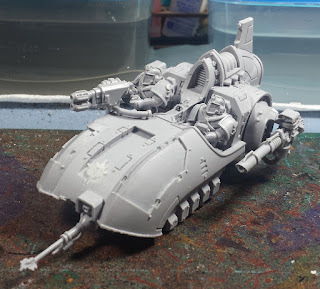 Mordian 7th Regiment: Heresy Era Thousand Sons - Volkite and Plasma and Melta, oh my! Heresy Era Thousand Sons - Volkite and Plasma and Melta, oh my! Another hectic week I'm afraid, but did manage to sneak in a little hobby time here and there. I had quite a bit in a half assembled state as I'd run out of heads and was eagerly awaiting a box of joy to arrive from FW, bearing the newest book Inferno as well as a number of upgrades and add-ons for the burgeoning Thousand Sons. The box was waiting on my doorstep earlier this afternoon and after some frantic soak and scrub I managed to finish off a couple more squad builds for the force! First up is Tactical Support Squad Tolbek, armed with Volkite Calivers. I've always loved the good ol' Martian heat beam, but this is the first time I've actually done a unit of them. I enjoy making ridiculous sound effects in-game, so I'm looking forward to saying "CHOOM!" in upcoming games (being the official volkite noise). Next is Heavy Support Squad Khalid, bearing plasma cannons, and wearing the heavier Mk.III armour which I thought suitable for them. The Thousand Sons also gain the option to upgrade any plasma cannons to Aether-fire ammunition, which grants them Soul Blaze. "FOOM! Crackle, sizzle, pop..."
The final bit of the building frenzy is the first of three Javelin Attack Speeders. They're kitted out for tank hunting, swapping out the default heavy bolters for Multimeltas (leftover from the pintle mounted weapon sets I'd picked up for the earlier Imperial Fists, fortuitously), and rocking a twin-linked lascannon. This one vehicle throws out both the "HISSSSS! ", and the all-important "FREEEEM!". 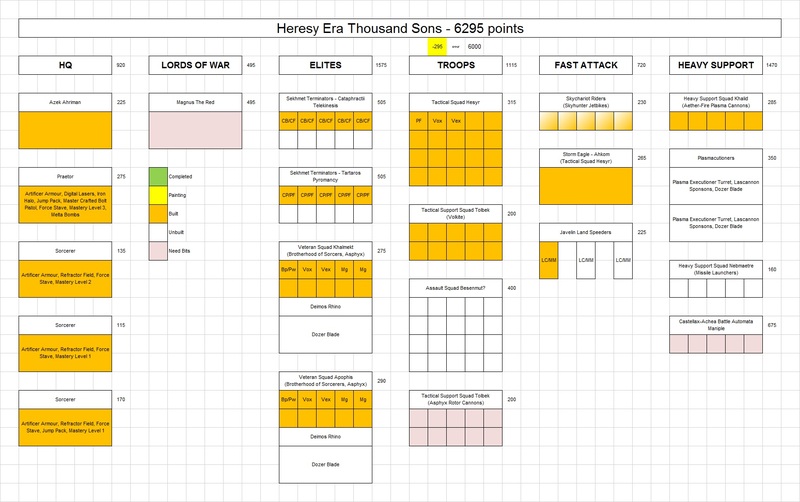 Updated the painting chart, and realized I'd forgotten to en-capitate the Sky Chariot riders, but was pleased to note that with 3 exceptions the bulk of the army is in hand and well on the way to viability for some test gaming and painting (once we get a break in the chilly weather to primer, that is). Speaking of gaming, I'm actually getting a game in over the upcoming weekend (GASP!) trying out some Zone Mortalis for the first time, on some kickstarter terrain that I'd built ages ago but never actually used. Should be fun, I'm playing a force drawn from the Imperial Fists for Adepticon, and will be facing off against some heretic Word Bearers. Pics to follow! Wow, busy again. That terrain looks great! And one can never have enough CHOOM! The sound effects are the most important part I feel. That is a lovely lot of resin there. Looking forward to the game report! Love those Plasma Cannons. 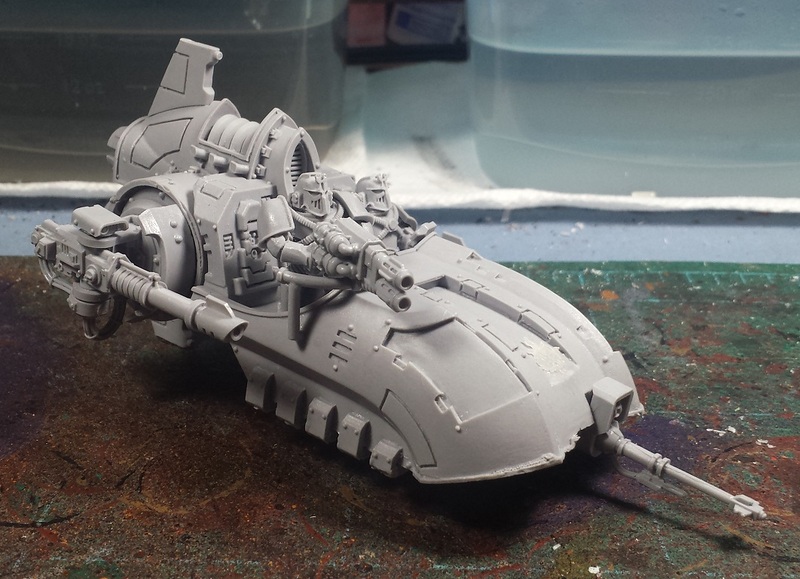 Nice stuff, look forward to seeing the Zone Mortalis board in use. Imagining those sound effects reverberating around the walls of that terrain. @Col. Hertford: Indeed! Looking to incorporate a bit more volkite into the force, might add a Culverin heavy support squad too! @Rory Priest: Hah! Absolutely - It's an integral aspect of proper wargaming! @Riot Ville: Coming right up! @Siph_Horridus: Thanks! They were a little challenging to assemble the cabling but in the end they look pretty neat! @Zab: Cheers! It definitely needs a lick of paint, but even in its wooden state it's kinda neat! I can't wait for the zone mortalis post! 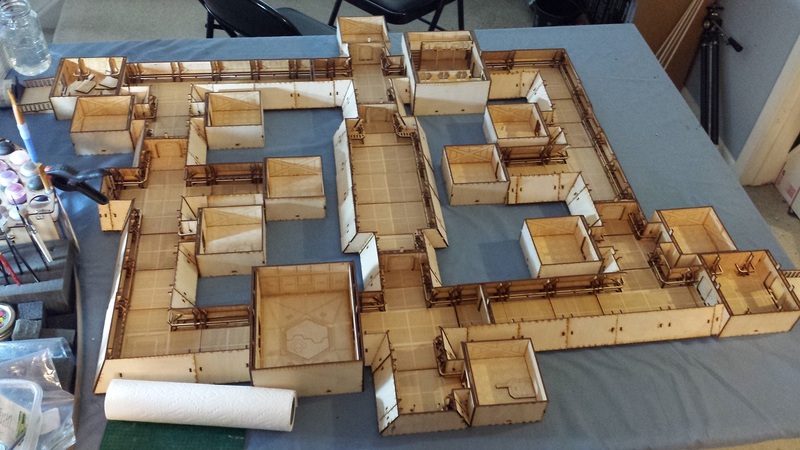 We are getting prepped to have a zone mortalis game and haven't even begun the terrain search. That terrain looks like a great base to start with. Some day Joel...I want you to just do a time lapse video of you working. Your speed is just something to behold. @John Stiening: Coming right up! I'll include the info to the shop that makes the terrain - the quality is top notch, and ought to look awesome painted up. @Greg Hess: Hah! You'd mentioned doing video chat painting days back at Nova, are you still doing that occasionally? @Greg: Very cool - I'll have to see about getting internet access up to the hobby loft so I can set up a laptop and camera up there!